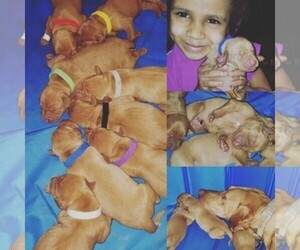 We have been breeding vizsla puppies for over 15 years! Our puppies are played with and socialized at an early age. We have excellent bloodlines and breed for the natural qualities of the vizsla breed, they are excellent hunters and family companions. Parents are AKC registered. Puppies will come with AKC papers and current vaccinations. Shipping is available. Offering the most beautiful vizsla and weimaraner puppies, taking great care and pride in our puppies by offering a natural, free country setting and loving home environment for both the parents and puppies. Litters limited to 1-2 per year. Parents are family members and both always on site. The Weizsla is here! Our litters are being raised in our home and are descendant from AKC Weimaraners and AKC Vizslas. with AKC Champions on both sides of the bloodline. Our puppies have constant interaction with our other dogs and humans. The Sire weighs 74 lbs at 25.5&amp;amp;amp;amp;amp;amp;amp;ldquo; tall while the Dam is weighs 54 lbs at 23&amp;amp;amp;amp;amp;amp;amp;ldquo; tall. The Weizsla inherits the best traits from the Weimaraner and Vizsla; gentle loving companion in the home and are easy to train hunting dogs. Westwind Kennel of Texas Vizslas is on Facebook if you want to see pictures of previous puppies and their new owners. We are dedicated to keeping the Vizsla breed pure and healthy. We have the dam and sire in our home (or maybe they allow us to stay in their home, hard to tell). Penny had nine puppies the first of September. Call to reserve an AKC Vizsla puppy for your family. We are the Leusink family located in NW Iowa. We have been raising Vizslas for over 15 years. We produce top quality Vizsla puppies. Visit our website leu6vizsla for current availability. Looking for a reputable Vizsla breeder in your area? Simply browse through our nationwide directory of 1000s reputable Vizsla breeders - complete with website addresses, dog breed profiles, and current puppies for sale.